Drag-and-drop an ics file into the main window. VueMinder can import iCalendar (ics) files. Most major calendar programs support this standard, so if you're migrating from a different calendar program, you can export your calendar from that program, and import it into VueMinder. You can also import calendar files downloaded from the web. To import an ics file, select "iCalendar (ics) File" as the import source and then click the Next button. You can also drag-and-drop an ics file into the VueMinder window, or double-click an ics file to open it in VueMinder. After selecting an ics file to import, the window will update to enable the destination calendar name to be specified, as well as several import settings. The destination calendar name will be set to the calendar name read from the file. You can choose to import the file into a different calendar by selecting one from the list, or by typing in a different name. If you type a name of a calendar that doesn't exist, a new calendar will be created while importing. To include reminders, check the box labeled "Import reminders, if present". This setting will also include any VueMinder-specific data, if the ics file was previously generated by exporting from VueMinder. You can also chose to apply the destination calendar's default event settings to any new events that are imported and were not exported to include these settings via VueMinder. Note, to prevent the possibility of a large number of reminders from being displayed after importing, events that occur in the past will not have their reminders enabled, even if the default calendar settings specify a reminder. 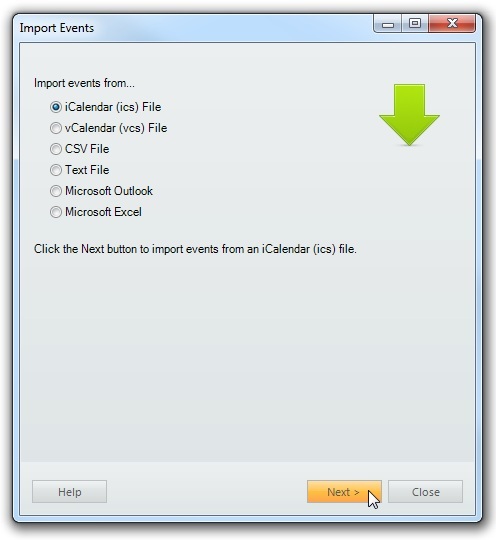 After you've selected a file to import and a destination calendar, click the Import button. The calendar file will be imported into the specified destination calendar. 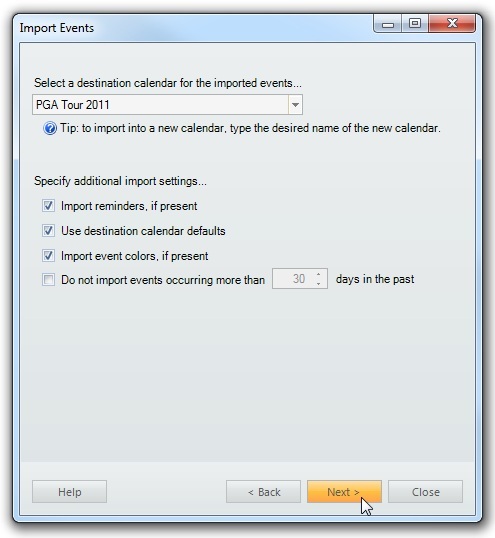 If the destination calendar already exists, and contains events that are either duplicated in the ICS file or do not exist in the ICS file, an Overwrite/Delete Events window will be displayed enabling you to select which existing events in the destination calendar should be overwritten or deleted. 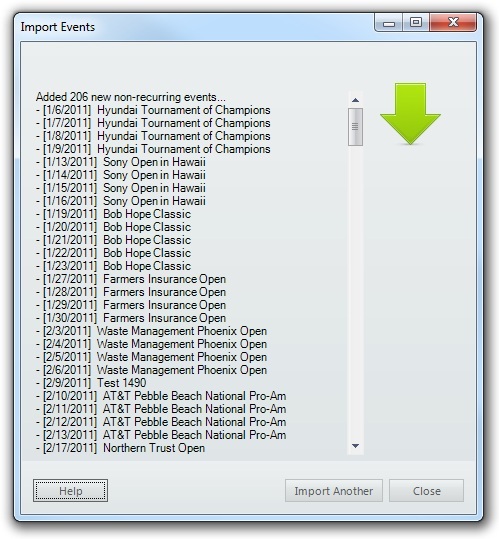 The import results will be displayed after the import is completed, where you can see the number of events that were added, updated, deleted, or overwritten. The Calendar View and Event List will also update to show the newly imported or updated events. Note that if the file being imported contains any events with actions to run a program, those actions will be disabled for security purposes. If any errors are encountered during the import, a window will be displayed providing more detail about the error that was encountered, and where the error is located in the ICS file. Errors can occur if the file being imported does not properly conform to the iCalendar file standard. 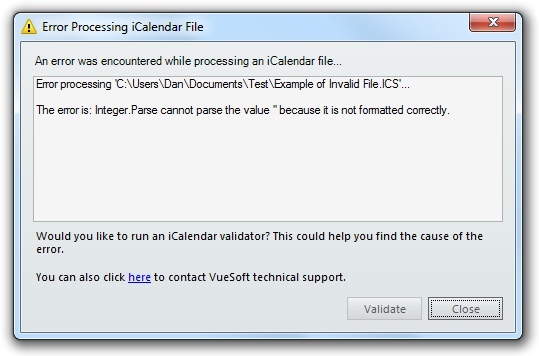 To validate the ICS file and determine whether the failure is due to the file not properly conforming to the iCalendar file, click the Validate button. This will launch a web-based utility. If you need additional help, you can click the link on the window to contact VueSoft support.